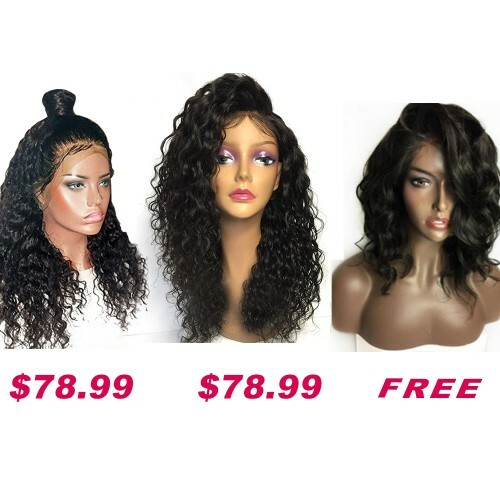 Buy 2 Get 1 Free Curly Wigs Sale On Summer Pack PWSF414 Can Save $42.43 In Total. The hair is beset soft..?I suggest only greet those hair if you are experienced with curly synthetic hair because it will tangle..?over all I'm impressed. The price is sooo much nice! I am pleased with the style of this wig package. They're all full and all has amazing natural baby hair. ?I'm looking forward to wearing them in different styles. I'm really super satisfied with this purchase! I like every hairstyle, and they are all super suits me, so amazing I have three different styles! I believe that after you bought it, the most satisfied is its price, really really very favorable! The quality is also good. The lace and hair are very soft. I will recommend it to my friends.